Park Forest, IL-(ENEWSPF)- Park Forest‘s financial whiz is set to retire. She has been with the Village for 22 years, and come July 14, 2017, Director of Finance/Deputy Village Manager Mary Dankowski will no longer show up for work. But she will be far from gone. Under her tutelage, Park Forest has embraced a conservative approach to budgeting. Her projections are cautious, but realistic. And Park Forest has won the Distinguished Budget Award from the Government Finance Officers Association (GFOA) for 21 years, after she completed her first budget with staff and the Village Board. Park Forest has also won the Certificate of Achievement for Financial Reporting, also from the GFOA, for 19 years. There was a time when the plaques from these awards lined the back wall of the Board Room. Now, however, there are too many to post on that wall. Each year’s notice is noted on two smaller plaques. And Dankowski is not quite finished. 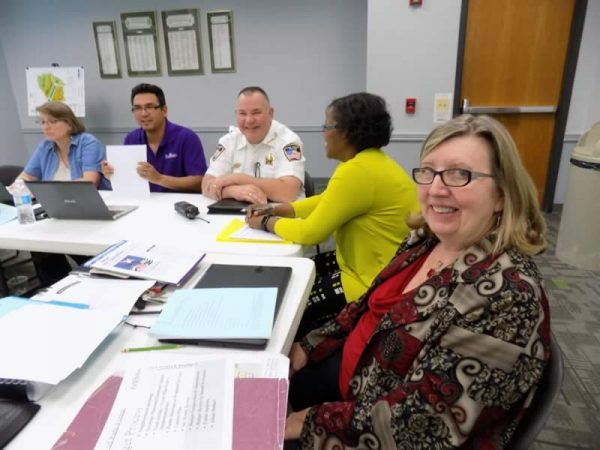 On Tuesday, May 2, she began the last of her budget review sessions with the Village Board, this after introducing the budget for the next fiscal year to the public the evening before at the board meeting. As someone who has worked with Mary Dankowski as a board member, I came to admire her tenacity and depth in the world of finance. As each budget was presented, Mary had page numbers memorized — or so it appeared to me. She knew tables, charts, and the narrative of each department fluently. As each department presented their proposed budget, Mary embraced changes and suggestions from board members. But she was also quick to explain the limits of Park Forest’s tax base, so often a burden to residents. As a homeowner in Park Forest, she understands. And she has no plans to move after retirement. “You’ve been in strategic planning and in budget review with me,” she says in our interview, “and I love my job. I love a lot of it. I love making a difference in the community and feeling like managing the finances well improves the quality of life for the residents in some ways. Dankowski is President-elect for the Park Forest Rotary, remains treasurer for the Tall Grass Arts Association, and she is fundraising chair for the League of Women Voters of the Park Forest Area. “I’ll stay doing all of those things,” she says. She also asked Mayor Ostenburg if she could remain as the appointed member of the Firefighters Pension Board. She credits the pension boards, both police and fire, with the strength of those funds. 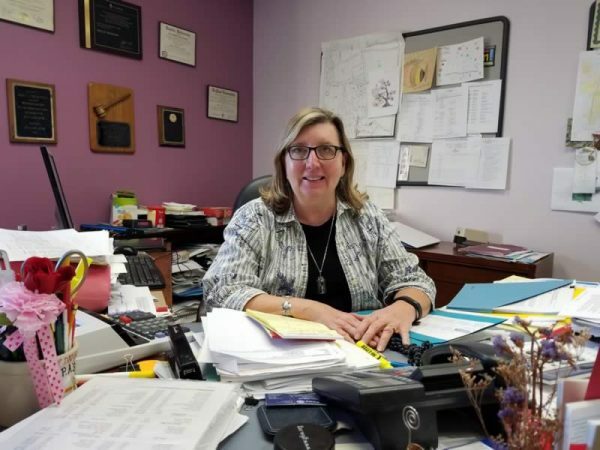 “Both police and fire [boards] take their jobs very seriously and really operate in what’s in the best interest of the funds, which is what’s in the best interest of the Village,” she says. Any differences between finances today compared to when she started? “There were some challenges of just identifying where I could pull together resources to just carry on with a couple projects that were under way,” she says. Starting her tenure with the Village of Park Forest in 1995, Dankowski says one of her biggest challenges happened at that time, when the Village bought the DownTown. “I was here with the whole decision to purchase the DownTown.” The price? “$100,000 plus back taxes,” she says. So she was on board to begin the redevelopment of the former Park Forest Plaza. “I feel really good about that success story,” she says. “We have a viable, little DownTown. Of course, we have some vacancies, but we have a lot of tenants. We have over 50 tenants in the DownTown.” This includes the upstairs spaces. “One of our newest tenancy has been O.A.I., the MakerLab, is moving their lab from upstairs to downstairs to the former food co-op space, expanding their presence in the DownTown. That’s pretty exciting,” she says. The SouthWorks MakerLab, currently located at 210 Forest Boulevard, will keep their second floor space for their offices, but the lab itself will move downstairs. With one more phase to go, the Village will have replaced all of the second floor windows in the DownTown with energy efficient windows, a project Dankowski oversaw. She chuckles when asked if there were separate funds in the budget when she began. There were funds, she says, but no fund balances. Is Park Forest a good place to do business today? What would improve it? The economy continuing to turn around and for property to increase in value, she says. During this part of the interview, Mary began going through the many papers that surround her, quickly discovering the most recent Village Audit. As always, she seems to instinctively know on which page the tables and charts she seeks can be found. In this case, she arrives at a graph that shows the EAV of the Village of Park Forest through recent years. What would she like to see happen moving forward? She says another positive move, being overseen by Director Hildy Kingma in Economic Development, is the demolition of abandoned and blighted homes. These demolitions improve residential neighborhoods. “That’s really laying the groundwork for growth and future increase in value,” she says. She would also like to see the budget process remain in place after she leaves her position. “The budget is a year-long process!” she says, laughing. The budget is a living document, a guide for spending. But the Village stays on budget, and much of this is due to the discipline Dankowski has asserted over Village finances. Other towns in the South Suburbs have mere spreadsheets posted on their websites purporting to be budgets. As one who worked on many budgets with Mary Dankowski through the years, it appeared to me that she had every draft budget memorized, down to the page, as each budget was presented. Does she have it memorized? “I know where it is! I know where it is!” she says. Director Dankowski’s official last day on the job is July 14. She is currently going through the lengthy budget process, her last, with the Village Board. Immediately after her retirement, she plans to vacation a bit. I’ve seen many budget presentations, in business and non-profits, and Mary’s does an outstanding job. Park forest has been fortunate to have her.